IELTS stands for the International English Language Testing System. Simply put, IELTS gauges the language proficiency of those people who want to study or work in environments where English is used as the principal language of communication. IELTS has an easy-to-use 9-band scale that clearly identifies a student’s English-language level, from band score 1 (i.e., a non-user), all the way to band score 9 (i.e., an expert user). The exam is administered by Cambridge ESOL, the British Council and IELTS Australia. The goal of IELTS is to provide its examination takers access to the highest standard level of English language assessment. Numerous universities and employers in many English-speaking countries, such as Australia, Canada, New Zealand, the UK and the USA, recognise IELTS in their application criteria. Furthermore, IELTS is also accepted by many professional bodies, immigration authorities and other government bodies. So if you are a motivated student who wants to do the IELTS examination, contact MySkypeLessons and we can discuss your IELTS preparation course further. Please note that your grade would depend on how well you commit yourself to the preparation as well as the frequency of the classes. Students can expect four parts to the IELTS examination. In order to be assessed, students must sit all four parts. Whereas all IELTS candidates take the same Listening and Speaking tests, their Reading and Writing tests will depend on whether they have elected to sit the Academic or the General test. Duration: 60 minutes. Students are given an Academic Reading test, or a General Training Reading test. Both tests consist of three sections, and in both tests the sections are in order of increasing difficulty. Duration: 60 minutes. Again, students take either an Academic test, or a General Training test. 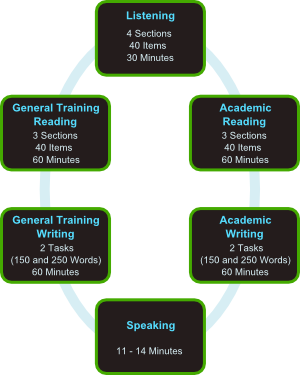 Students must perform two writing tasks, which require different styles of writing. NB: there is no choice of question topics. Duration: 30 minutes. The test consists of four sections, played on cassette tape, in order of increasing difficulty. Each section might be a dialogue or a monologue. NB: as the test is only played once, the questions for each section must be answered while listening, although time is given for students to check their answers. And a two-way discussion thematically linked to the individual long turn. Topic: Governments should make more effort to promote alternative sources of energy. To what extent do you agree or disagree with this opinion? Issues related to new sources of energies are frequently discussed these days, particularly in the media. Some people think that governments should promote the research of new energies, whereas others believe that governments have to focus on more important topics, e.g. incentives to improve the economy. On one hand, alternative sources of energy are an important component to protect the environment in the future. For instance, instead of using fossil fuel, which has negative impacts on the environment regarding global warming as a consequence of emitted greenhouse gases, renewable energies such as solar or wind energy could substitute it. First of all, in contrast to fossil fuel, it requires only basic equipment to convert it into usable energy. Secondly, the countries would no longer be dependent on those countries which have the resources of fossil fuel. Furthermore, if alternative sources of energies were found, the usage of nuclear energy could be reduced. On the other hand, one has to act cautiously when developing and selecting new energies so as not to have any side effects, which could damage the environment. For example, some households heat their houses with wood pellets, instead of gas or oil, in order to protect the environment. Nevertheless, to create the wood pellets, many forests have to be deforested and the pellets have to be transported to their users, which also requires fossil fuel, the quantity of which will depend on the distance, obviously. As a result, it could be that more harm is caused by the idea of the developing a new energy than preserving the environment. Moreover, the idea of using biofuel is good, though the consequences of increasing food prices are often ignored. All in all, even though governments have to address possible side effects, it would be good if they promoted the research for alternative sources of energy. In my opinion, it is very important to support the development of different energies in order to eliminate the ones which threaten us, e.g. nuclear energy.